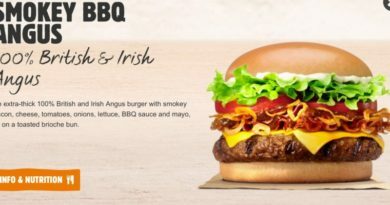 Burger King Long Rodeo BBQ Burger - Price, Review, Calories & More! 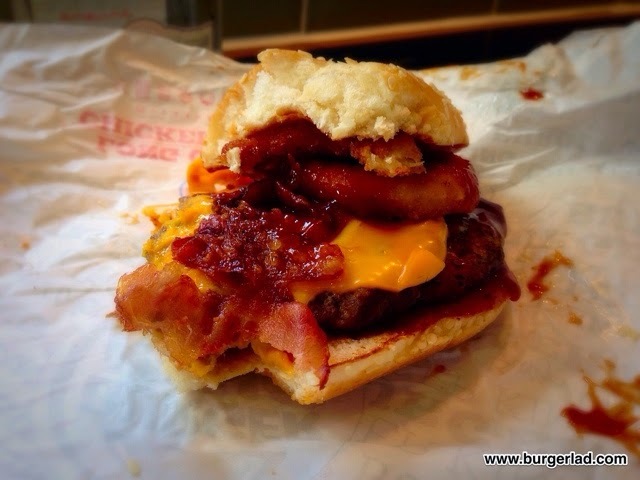 A rootin-tootin flame-grilled, triple burger topped with smokey BBQ sauce, crispy bacon, golden onion rings and cheese. Yeehaa! 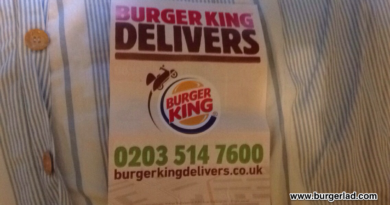 Price: £4.49 for the burger only (price subject to variation). 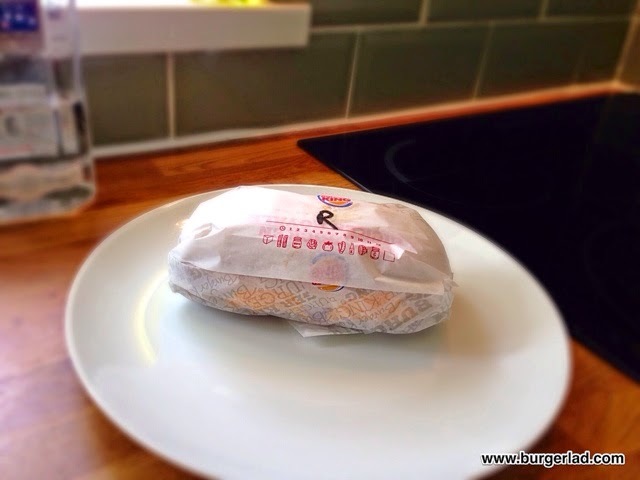 It seems Burger Lad® has lost his BK mole as the Summer BBQ range was launched on Tuesday and we had no idea. Oh well… it was good while it lasted. 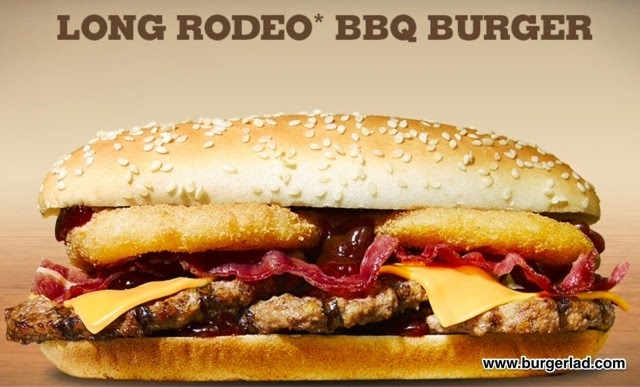 It seems like ages since I personally did a Burger King review and when I saw the Long Rodeo BBQ Burger I remembered the Extra Long Chilli Cheese Beef. Summer is here and so are the summer burger specials at all the various burger outlets. 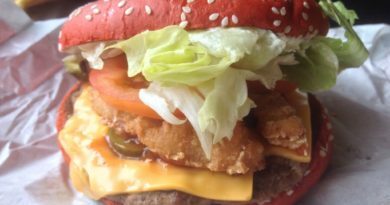 At Burger King, it’s Summer BBQ in the form of the Whopper, the Rodeo and the Tendercrisp. The Summer BBQ is essentially barbecue sauce, cheese and bacon. I could have gone for any of the three, but this time I decided on the Rodeo. Looking it up, I realised that bacon and cheese don’t actually form part of the standard Rodeo. Cheese does put in an appearance on the Double Rodeo though. In addition, the summer BBQ Rodeo is “long”, i.e. in a long bun instead of the usual round ones. Finally, all rodeos have the onion rings as their unique selling point. This was another trip to the drive-thru, but rather than sit in the car and eat, I’m going to take it home. 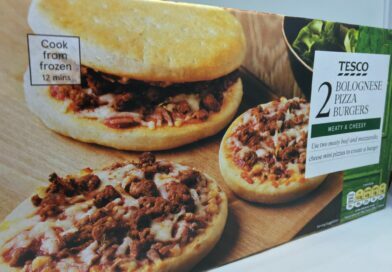 It’ll also show how well the packaging retains the burger’s heat for fifteen minutes. It’s quite nice driving out today. Sun is shining, lovely and warm, and there are plenty of St George’s Crosses fluttering from cars and homes. But some of them still have “England” emblazoned across the middle. Why, for goodness sake? It looks awful. Anyway, I pull up at the BK window, place my order and pay. At the second window, it’s not long before my Long Rodeo arrives. I can smell it in the car. Mmmmm. Quick dash home, past all the flags that apparently I’d be unable to recognise without the caption, and I start unpacking my burger. Firstly I realise that heat has been retained quite well, which is really good. Secondly, it seemed to have been put together rather well. 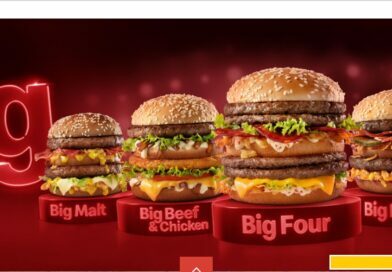 The longness comes from the sub-shaped bun and instead of a long patty, two smaller round patties are overlapped. 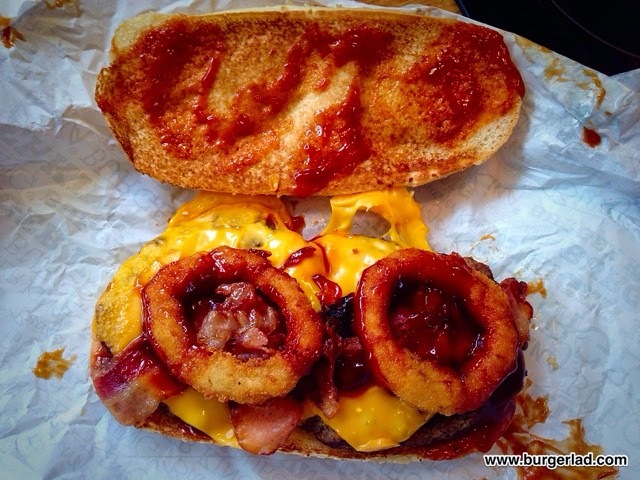 On top, very generous helpings of cheese and barbecue sauce, as well as bacon and the Rodeo’s trademark onion rings. The sauce and the melted cheese help make this a sloppy mess, which is fantastic. The summer BBQ sauce seems very sweet and is quite apparent throughout, but doesn’t overpower the BK flamey beef taste that sit on top of the other flavours from start to finish. 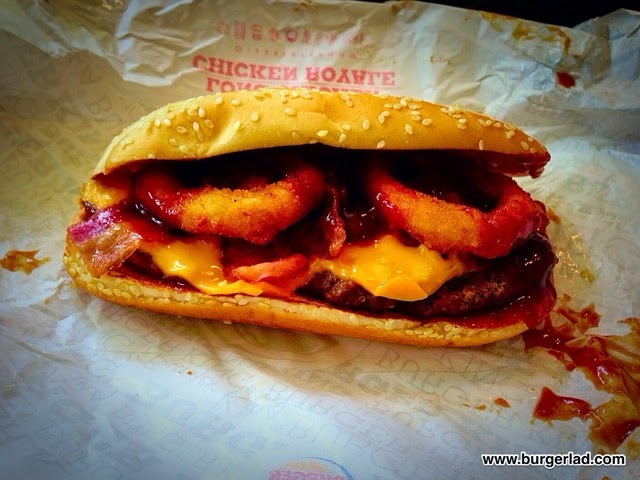 The onion rings and bacon are very subtle and add depth and texture. There’s no lettuce and no tomato on this cowboy. It’s not a big burger by any stretch. Long, yes, but not big. It’s easy to finish and actually very tasty. It really goes down well and I’d thoroughly recommend it. 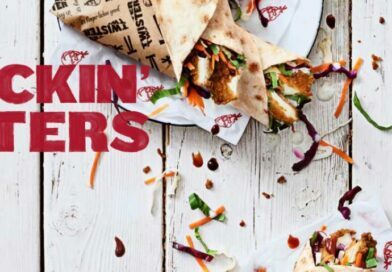 The Summer Whopper and Tendercrisp employ the same sauce so both would be worth a go. I’m assuming the range will be around for a while. Would I have it again? No. 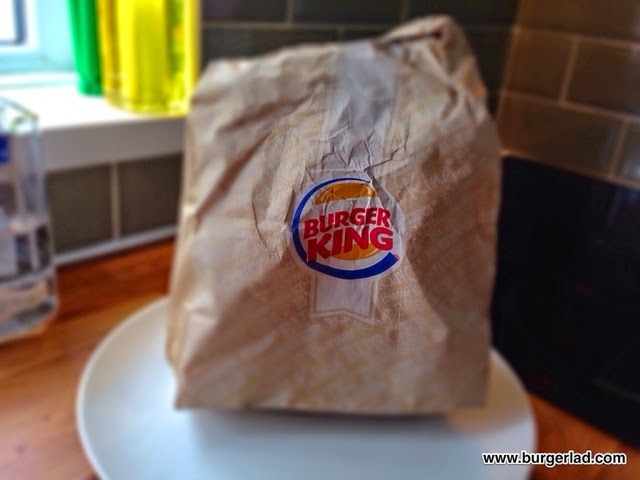 Too much choice and too many burgers on my to-do list but as I said, I’d certainly recommend BK’s summer range. Until next time, yippee ka-yay! Thanks Andrew for this analysis of the Burger King Long Rodeo BBQ Burger. 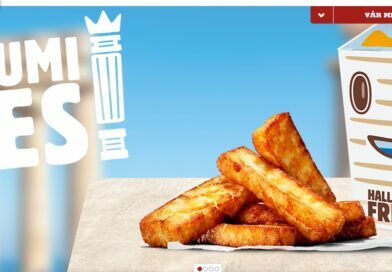 We want that Summer BBQ Whopper review on my desk for 09:00 Monday morning! I jest… or do I…!? tasted so good to me i was a happy fapper long into the night time !